February is America’s—and Canada’s—“Black History Month.” It is the month that Americans have dedicated to celebrating the history and milestones of black America. Typically, the celebrations consist in the veneration of African-American historical personages whose valor and commitment influenced the course of African-American life. But I have chosen to depart from that tradition. 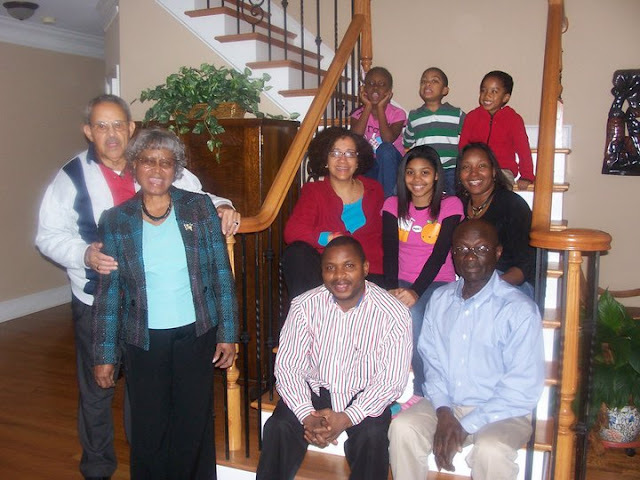 I will instead celebrate a little-known African-American family in whose home my daughter and I have found uncommon warmth, acceptance, and friendship; a family whose remarkable kindness to us symbolizes the enduring, if occasionally strained, bond between Africans on the continent and their long-lost kith in the historic western diaspora. Sometime in early 2007, in the course of my doctoral studies, I found myself in a seminar with a gentleman by the name of John Baker Brown Jr. who was also a doctoral student in a related field. From his looks, I could never have guessed that he had a son who was my older brother’s age. He looked like he was only 10 years older than I was. 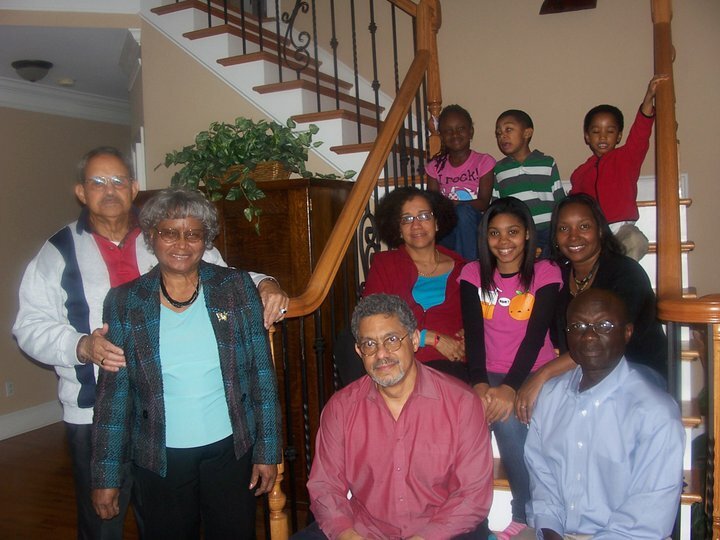 Front row: John Baker Brown Sr. and his friend, Nancy; John Baker Brown Jr.; John's cousin's husband, Yaw, who is Ghanaian. Second row: John's first cousin, Ruth; John's daughter, Lydia; John's wife, Delilah. Third row: my daughter, Sinani; John's son, John Baker Brown III known as Tre; and John's cousin's son, Kwame. He was also, for all practical purposes, “race-agnostic,” that is, he was so light-skinned that I couldn’t immediately tell if he self-identified as an African-American, an Arab, a Hispanic, or even a white man. But I felt inexplicably certain, nonetheless, that whatever racial identity he claimed, he had a huge pool of (latent) African genes flowing in his veins. I was right. Just weeks into the seminar we were both enrolled in, we hit it off. Then we shared office space for many years in the course of our studies. Like me, John also taught undergraduate courses while pursuing his Ph.D.
His conviviality, friendliness, kindness, and complaisance are unparalleled. And I don’t say this lightly. Before long, he introduced me to his wife, children, father, brothers, cousins, in-laws, and other extended family members. 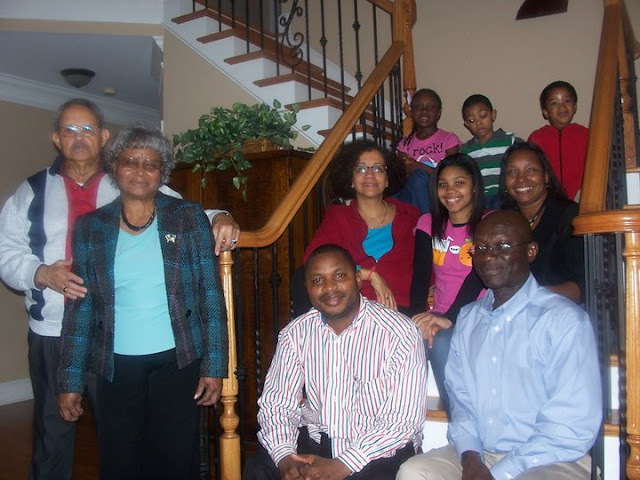 His is a multi-generational household, the kind I also had when I grew up in my sleepy, little hometown in Nigeria. He shares a huge house with his wife, children, father, and distant relatives. So it is not only his—and his family members’—remarkable generosity toward me that makes me feel at home in his home; it is also the Africa-like structure of the family and the contagious familial love they radiate each time I visit them. My late wife had eagerly looked forward to meeting this wonderful family. She used to ask after them without fail during every single phone conversation we had. I wasn’t surprised when I discovered that the only picture she had in her purse at the time of her death was the family picture of the John Baker Brown family that the family had given me to give to her. She was supposed to meet them in December 2010. They couldn’t wait to meet her. In more ways than I can express, I owe my ability to cope with the heavy emotional toll of my wife’s death to the open-handedness and good-naturedness of the Browns. John Brown would leave his job to help me scout for schools for my daughter. On many occasions, he would come to pick her up from my house to play with his last son who is about my daughter’s age so that I could have time to write my dissertation. When I traveled out of the state for conferences and job interviews for days, it was with his family I left my daughter. Up to this moment, John and his family never fail to periodically call, text, or visit to find out how we are coping. As I wrote in the acknowledgement page of my dissertation, John Brown and his wife, Delilah, have adopted me and my daughter as members of their own family. They have simultaneously become my parents, siblings, and friends in Atlanta. Their home is our second home not only in Atlanta but everywhere. One of the best “gifts” I can give to my daughter is to tell her that we will visit the Browns. She screams in joyous abandon and embraces me tightly. That’s how much she loves to be with the family. Apart from my own parents, no one has ever shown me the the kind of love and care and concern that I get from the Brown family. I feel so completely at home in their midst that I sometimes forget that they are not my blood relatives. Thinking about it, I am not even sure that I don’t, in fact, have remote, for now undetected, ancestral affinities with the family. One of John’s first cousins, for instance, is married to a Ghanaian. Another first cousin of his, who converted to Islam in the 1970s, is married to an African. And his wife’s sister, also a Muslim convert, is married to a Gambian. I have met all these people in John’s house on many occasions. John is not only a devoted Christian; he also has a graduate degree in Christian Theology. His dad, John Baker Brown Sr., an 88-year-old military veteran, is a high-ranking official in his church. Yet you can’t wish to meet a more religiously tolerant person than John. When in my August 6, 2011 article titled “Islamophilia in Christian Black America” I talked of “a very religious man who, in fact, studied Christian theology at a seminary [b]ut [who]… is one of the most thoughtful critics of Islamophobia that I have ever met,” I was referring to John Baker Brown Jr. I have chosen to celebrate this extraordinarily gracious and obliging family because they represent a sample of the kinds of friendships and accommodation that black America extends to Africans in America, but which is both unreported and unacknowledged for the most part. The bulk of the commentary on the relations between Africans in America and black Americans often dwells on the tensions between the two communities. But that’s an incomplete portrait. I personally have never encountered any hostility in black America. What I’ve found is love, acceptance, and kinship. My relationship with the Browns is a crowning expression of this. There is no better time to pay tribute to this charmingly amiable family—and what they represent— than during the Black History Month. White Nigerian-Americans from My Village!